In front of the Temple of Apollo old stone troughs are removed and the whole area cleared awaiting new planting in the spring. Also at the rear of the building overgrown brambles, rosebay willowherb and nettles are cut down, in a bid to keep these rogues in check. The old compost heap at the top of the Parkland has been emptied out and this area remade for more functional future use. The well rotted compost is used to form a mound in the Little Wood, planted mostly with medicinal herbs and plants. Another batch is spread over the bank by the large Corinthian capital area at the front entrance, and planted with cranesbill, tidying up this whole space. 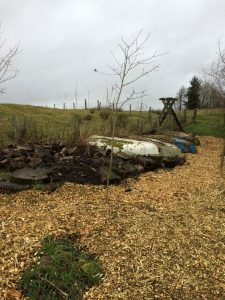 Much more work has continued in the Little Wood – an old trailer is removed and the last of many years worth of accumulated debris and rubble either removed or concealed – this whole area now forms a much more suitably composed space. In the Temple pond – the Great Piece of Turf / AD island has been cut back, and the willows behind the marble paper boat and aircraft carrier pruned down and reshaped where they had become a bit leggy. More planting has been placed out in the wild garden – including butterbur by the base of the Hand Grenade gate piers and the Grotto, and more seedlings and plants now in the greenhouses will be ready for spring planting in these areas. The 3 stone posts which form the leaf and bark poem have been moved from the lower pond to a new site in the pool opposite the end of Huff Lane. Repairs have been made to the lower pond to plug a hole in the bank, and the aqueduct is now running properly – the island has been reshaped as much of the flag iris is reduced – this spot will now be the place for the L’Ile des peupliers tree plaque – and a new stepping stone causeway to the island has also been constructed. In the Sunken garden – the stone walls have been cleaned of moss so that this area takes on a more formal arrangement – some stones have also been removed from the ground level and filled with plants to extend an intended ‘Persian carpet’ effect – sea pink, life everlasting, grim the collier – these should hopefully merge together and give us a colourful display next summer. New posts have been put in for the raspberry canes in the Kailyard, and some of the overgrown rambling roses moved from behind them. The Kailyard itself has been given a final clearout for the season. Throughout the garden compounded grass pathways have been aerated and top dressed with sharp sand – a pre-prepared surface for reseeding next spring. Fallen leaves continue to be gathered, though hopefully the bulk of this work has now come to an end, with just a few late season stragglers hanging on to windswept branches. Trees have been removed in the front garden, the temple garden and the woodland including those left damaged by storms and those now out of place or overgrown. In particular a light stealing sycamore by the stone altar in the front garden – leaving space for a young walnut to grow out – and a dangerously leaning willow by the middle pond in the woodland where its shifting root ball has been causing damage and leaking to the edge of the pond. New trees have been ordered for some other spaces – in particular Norway spruce to give the intended ’Black Forest’ effect by Heidegger’s Holzwege – (Woodmans Path); extending the yew perimeter in the Roman garden; a new rowan for The Rowan is Learning to Write; and crabapples by the entrance to the allotment / LN / Homage to Lorine Niedecker.